Orioles are one of the most common backyard birds and their orange/black color is hard to miss. For the average birder attracting orioles will be an easy task, and by offering the right menu these birds will be scrambling to get in line. These are migratory birds so in their northern range you will mostly see them in spring and summer. - Sweet Fruits like oranges, wild berries, apples, peaches, pears, grape and bananas. If you plant to attract orioles to your backyard there are special Fruit and Jelly Oriole Feeder available for the task. Orioles designed feeders can be installed to offer fruit or mealworms, and are not expensive from the local pet stores or online. Even normal tray platform feeders can be used to attract orioles, these feeders are great to attract other songbirds as well. Standard seed bird feeders are not suitable as orioles eat very little or no seed. For just a few dolars you can install Nectar Oriole Feeder in your backyard, and these bird will readily fly up to take some of that sweet liquid. If you are attracting hummingbirds orioles might be already visiting your feeder, the same recipe you use to make hummingbird nectar is also good for orioles. You can mix normal white sugar with water about 6:1 water to sugar ratio and offer it in a special nectar feeder. Buying commercial made nectar is fine, but you can save some money by mixing your own. It is not bad to place the feeder in a shaded area to prevent sugar from fermenting, never place the feeder where cats and other predators can easily sneak up on the birds. Cats love to hunt for small songbirds. Home made marmalade is on of the best things you can offer to orioles. These bird love sweet, and the fact birds dont have teeth is a good thing, because orioles wold be going to the dentist a lot. You can buy normal marmalade, or jams from the supermarket or home made, orioles will love orange, cherry, peach, and other fruit flavors. Place the food on a Fruit and Jelly Oriole Feeder , tray feeder or a small dish. Make sure the marmalade is sweet, these birds get their energy from the sugar just like the hummingbirds. It is best to diversify the food you offer to the orioles, just like other animals, these birds need a balanced diet. Offer suet, fruit, nuts and marmalade at different times so orioles can get all nutrition they need. - Pesticides are bad for birds if you have a garden, grow organic vegetables for your and the birds health. Small song bird eat a lot of insects in summer to feed their young, and using pesticides can lower the survival rate of the chicks. - If you plan to grow a natural garden, plant shrubs that produce berries. Blueberries, blackberries and other similar shrubs are excellent to sustain a healthy bird population near your home. - Flower garden is a great addition for every home. You dont just enjoy the beautiful colors and smells, but have a chance give birds a place to hunt for insects and food. - If you install oriole feeders, place them away from cats and predators, if the bird can see the cat coming it will have time to escape. - Keep nectar, fruit and marmalade feeders in good condition by replacing the old food. The best is to check them every 2 days in hot weather so the sugar does not get fermented. 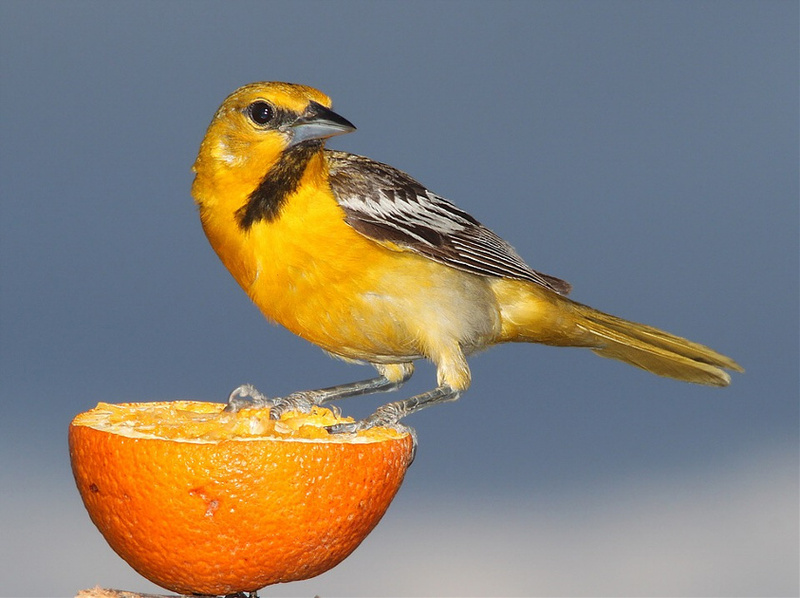 Suet will attract orioles but other bird species as well, marmalade and fruit will mostly attract orioles. If you want to attract more birds install a standard seed bird feeder in your yard. This way you can enjoy lots of different colorful visitors all-year round.